Pop music feels like it is at an inflection point in 2019. Women are now at the forefront, pushing the genre into more compelling directions than ever before. It’s not just women, but it’s women of color, specifically queer and lesbian women of color, who are driving pop music forward. 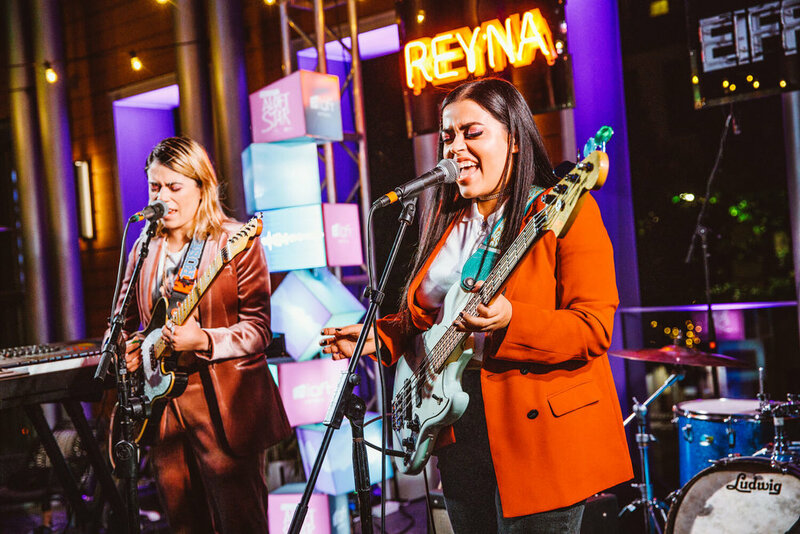 Counted among those women pioneering the next era of pop music is the border-bred and Milwaukee-based duo REYNA. Sisters Victoriah and Hannah Gabriela Banuelos consistently released stand out singles in 2018 with “Heartbeat” and “Cool With It,” and are set to continue in 2019. Coming off their recent Project: Aloft Star win, we chatted with the pair about their formation, how they’ve grown as musicians, and what the future holds for them. Luis Linan: Could you walk a us through a bit of your history? Victoriah Banuelos: We grew up in El Paso, Texas. We started writing music when I was 11 and Gab was 9. So we were very young and we wrote about going to school and our friends. We started taking music more seriously as we got older. Then we moved to Milwaukee and we wrote a song so late, so tired which we uploaded to OurStage.com in 2011. The song got picked up by [the] Skins MTV show, and we saw the whole song played on this TV show we were super into. So yeah, that just made us feel we were on the right track and should take this seriously. That’s when we started Vic and Gab, toured, did an EP and an LP under Vic and Gab, did SXSW, and we did a bunch of festivals and opened for many artists. We got discovered by a management team in 2014 and we’ve been doing REYNA since late 2015. One thing after another led to where we are today. LL: I want to ask a bit more specifically how the SKINS cosign happened? Hannah Gabriela Banuelos: I don’t remember exactly how it happened, right? VB: We posted the song on OurStage and I guess [the Skins team] were trying to discover artists. Our song was one of the songs that got discovered and was played in the show which was really cool for us. LL: I imagine that must have been very cool, to hear your song in a major show? HGB: Especially because they played the whole song. And it was in the middle of the season and it was a pivotal scene where all the characters’ stories were developing, so it was big. LL: Usually they play parts, or just the intro or outro, but you got whole song. LL: So you had records out as Vic and Gab and now you are REYNA. Can you talk about the decision to change names? Was it that you felt that the project had changed, or simply something you wanted to do? LL: That makes a lot of sense, choosing a name that better encapsulates who you are rather than just your names. VB: Yes, and when we got into the studio and started working with producers and started writing new music, it just felt like it was different to what Vic and Gab sounded like, just more grown up and everything, more professional. So it would just be better if we could make it more cohesive: brand new name and brand new sound. LL: That makes perfect sense. You mentioned that you started working with producers. When it was Vic and Gab was it just the two of you as primary songwriters, and as you’ve become REYNA you’ve brought in more collaborators? VB: Yeah, that’s right: we did everything for Vic and Gab. LL: Have you liked the change? The outside voices and influences coming into your sound and the new music you have put out as REYNA? VB: Yeah, I think working with people, especially the people we have worked with, has challenged us and made us better songwriters as well as players. It was hard to be open to it in the beginning, but as we got the hang of it and worked with more and more people, I love it. We have learned so much for every single we have worked on and I think it made us better musicians. LL: Awesome. You have been releasing a whole bunch of singles as REYNA. Are you working towards releasing a whole album, or are trying to string singles together to hone in on a sound before an album? What stage do you all feel that you’re in right now? VB: We have written so many songs we could put out an album if we wanted to. But we like focusing on a song and putting everything on it. We are actually going to release an EP. It is going to be a two part EP, so at first it’s going to be five songs, then later it’s going to be the second part with an additional 5 songs. So yeah, a two part LP [laughs]. It just gives us more time with the songs I think. LL: Do you feel some artists pump out too much music or an album too quickly and it’s not enough time for listeners to really take in the music after multiple listenings? HGB: Yes, and not just that. I feel that listeners now, they have a much shorter attention span, you know? So if you have a full album out I feel people don’t listen to five songs anyway, it’s a different time now so we’re rolling with that. LL: Times are changing and the way people are listening to music is different, so why not release music differently? I get that. HGB: We have to adjust to the trends, you know? LL: Speaking of trends: are there any artists or music trends that you are really getting into or inspired by? VB: We were very inspired by Sylvan Esso, we love their songwriting and think their production is so amazing. Who else? CHVRCHES, Tame Impala, Foster The People, you know, that realm of pop artists. There’s an indie band from the UK called Litany, they’re not big or anything but they really influenced us because they sound so great and the production is so good. They’re awesome. LL: Anything else you would like to let fans know you have coming down the line? VB: We’re working on new songs but we also have a new video coming out for “Heartbeats,” which is our latest single, and will be our first music video. We’re super pumped to get that out.